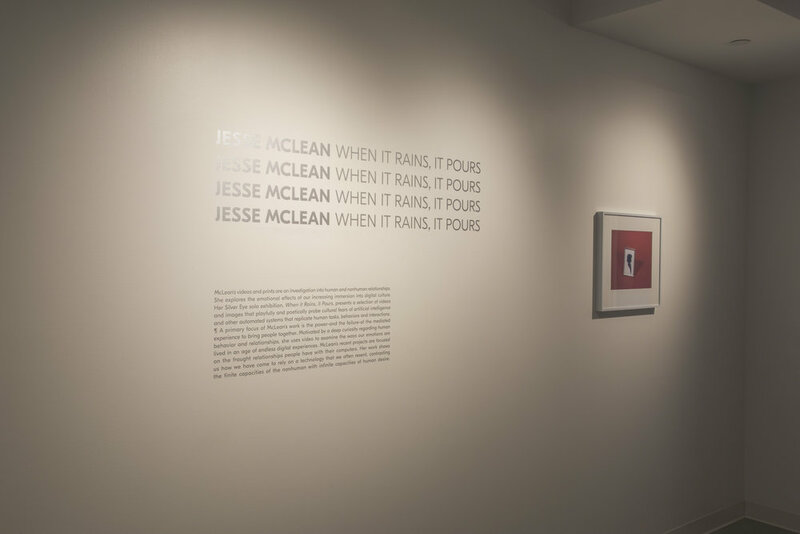 McLean’s artwork is an investigation into human and nonhuman emotional relationships, and an exploration of the effects of our increasing immersion into digital culture. Her Silver Eye solo exhibition, When it Rains, it Pours, presents a selection of videos and images that playfully and poetically probe cultural fears of artificial intelligence and other automated systems that replicate human tasks, behaviors and interactions. A primary focus of McLean’s work is the power-and the failure-of the mediated experience to bring people together. Motivated by a deep curiosity regarding human behavior and relationships, she uses video to examine the ways our emotions are lived in an age of digitally mediated experience. McLean’s recent projects are focused on the fraught relationships people have with their computers. Her work shows us how we have come rely on a technology that we often resent, contrasting the finite capacities of the nonhuman with infinite capacities of human desire.